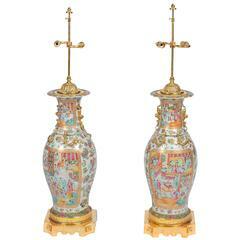 A very impressive pair of 19th century Chinese Cantonese or rose medallion vases or lamps. Each with wonderful bold colors, with classical oriental scenes of courtiers walking around pagoda buildings and gardens. The green ground having beautiful floral and foliate decoration, both vases being mounted on gilded ormolu bases. This stunning pair of English antique tea cans have been mounted as lamps. Statement lamps for home or office, circa 1890.